This is very comfortable and lasts for approximately 18 months of nightly use before the foam starts to flatten. Initially there was a chemical smell but I purchased an allergen pillow case with zipper to encapsulate the pillow, eliminating the smell in 2-3 days. 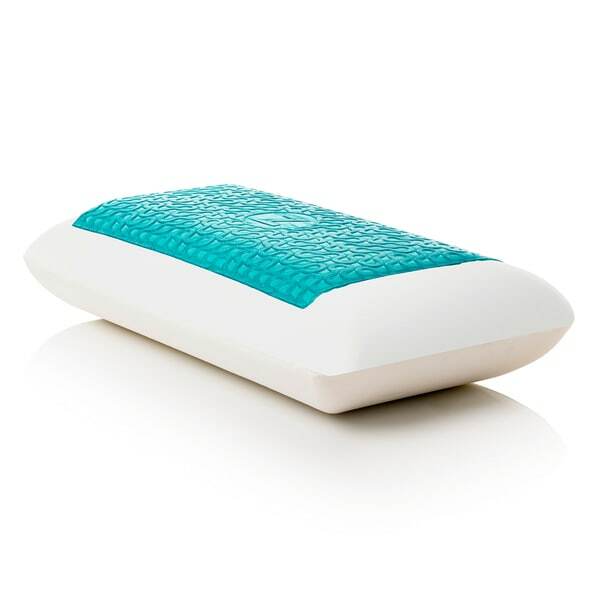 Stay cool and comfortable as you sleep with this luxurious Z by Malouf memory foam pillow. Complete with a cooling Z-Gel layer on top that helps it retain less heat, this memory foam pillow molds to the shape of your head, neck, and shoulders to provide the perfect amount of support. This pillow is also ideal for those who suffer from allergies since it is naturally antimicrobial. I wasn't sure ordering this online without seeing the product but the moment I received this I knew I made a great choice. This pillow feels wonderful and the cooling gel is a nice touch. There is a bit of a smell with the memory foam but if you air it out a bit it's fine. This is the most comfortable pillow I have ever owned. I highly recommend it. Just an amazing memory foam pillow. Make sure you look at the dimensions because the king is huge. Comes in it's own Carrying case and it's very thick but it allows your head, neck and shoulders align and feels like you are sleeping on a cloud. If you have a memory foam bed you really are sleeping on a cloud. Don't hesitate to buy. This pillow is perfect. As you get older you learn the best way to not add wrinkles is to sleep on your back. This pillow lets me do just that and actually sleep through the night. It is the perfect amount of coolness and firmness for my neck. I will never buy regular pillows again. We both like our pillows! I had a memory foam pillow before and liked it better than other pillows. I talked my husband into trying this new pillow, and we both like them very much. I used this pillow the very night I received it. There was a very slight odor but nothing to distract me from getting to sleep. I must say when I woke up it was morning. That was the first time I had slept all night in at least two years! I LOVE this pillow!!!!! Comfortable and cooling to let you get to sleep. I have trouble sleeping and staying asleep. This pillow has made a huge change for me. I noticed some of the reviewers said the pillow had a chemical like smell to it....my pillow had no smells at all. You will need a king sized pillow case if you get the big one. The cooling gel has also kept me cool at night and I am in the beginning stages of menopause. I bought 2 of these pillows. They support my neck and stay nice and cool. I slept through night the very first time I used them. I was waking up with neck pain with my old pillows. I have large shoulders, and these pillows are extra thick, keeping my neck straight. I bought the medium firmness which was perfect for me. I bought this for my wife and she absolutely loves it. She says this pillow cradles her head nicely, soft enough to relax, and firm enough so that you don't feel like the pillow is trying to swallow your head. She has had the pillow for 4 months now and has no complaints about it. It's very comfortable. My only issue is that the cooling gel isn't really cooling. Other than that it is amazing and has changed my sleep. Edit: I've been using it for almost six months now.It has really helped with my neck aches after waking. The cooling gel works better than I initially thought, I was just being hasty. It still pops back up to shape with no problems. BUT the actual pillow, under the removable cover, seems to come apart a little bit. I'm hoping that isn't a sign that it's already degrading. a little bit of odor to start... but love them! This pillow has lasted me almost a year and is still as thick and plush as when I first got it. They are great. Repeat purchase. I have bought several of these and am very happy with them. Bought the king size pillow and it is the weight of a small child. Other than that my husband loves it. He sleeps very well on it. Can't live without it! I suffer from neck issues due to an arm injury (go figure) and I can't have soft pillows anymore. This pillow is the firmest ive found and hasn't lost shape since I bought it a long time ago. I love this pillow. It's cool on one side and you sink into it. It takes a while to get used to it if you're not used to a foam pillow. Once I did, I sleep great. This pillow is too hard! Bought it as a gift and she hates it. Molds to your head easily and the gel side lets you choose if you want cooling too. Got it for my husband and he absolutely loves it! He likes the cooling gel he said it really works! "what is mid plush and high plush mean?" The mid is a lower height/profile than the high. The mid loft is about 6 inches thick and the high loft is about 7 inches thick. "Is it too cold or does it warm up? I hate being cold. Have bad shoulder pain. Would it help?" Memory foam does tend to retain heat, so you should not have issues with it being cold. Unfortunately, we are unable to give any medical advice regarding your shoulder pain. Thanks - I bought a memory foam pillow locally. Takes some getting used to !!!!! Research and preference. Looking for King size memory foam pillow, with gel for cooling. Not a lot of options out there. Great price for the size of specialty pillow.